While celebrating piano student achievements is valuable, recognizing their efforts is even more important. Why? Because praising effort encourages the development of something called “growth mindset”. Growth Mindset is a catch-phrase used in education circles that is important to acknowledge in the piano studio. Piano students who develop a growth mindset learn to believe that they can achieve anything so long as they put in the necessary time, effort and energy. Until now! 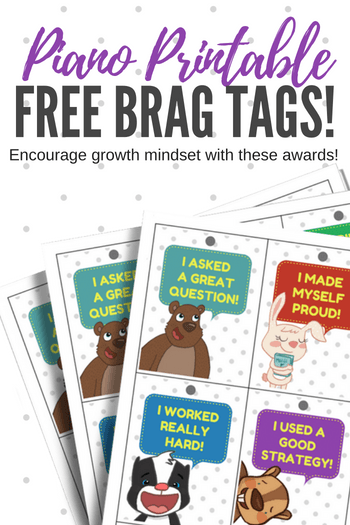 Because today we’re sharing a set of Piano Lesson Brag Tags; mini, collectable accomplishment cards that you can give to your students to celebrate those moments when they actively participate in their own learning process. 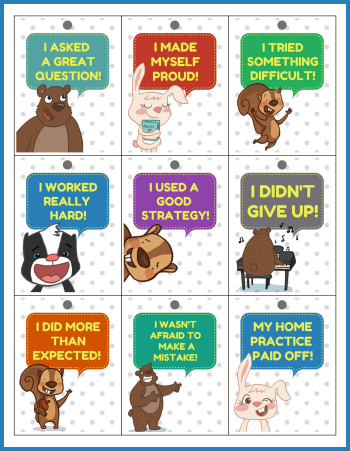 Piano Lesson Brag Tags contain encouraging statements that are effort-based, rather than achievement-based. They are awarded to your students and are hole-punched so that they can hang on a chain. You can display your students’ chains on your studio walls, or have your piano students keep them in their binders. Kids absolutely LOVE to build their collection of Brag Tags! Today’s set includes 18 different Brag Tags (see download instructions below). Print off several sheets of Brag Tags, laminate them, cut them out and hole punch the top of each tag (through the gray circle). Your students will each need a chain that they can use to collect their tags (search for “beaded ball chain” to make your own). Discuss the entire set of Brag Tags with your student. Ask him questions like, “What would using a good strategy in a piano lesson look like?” or, “Can you think of a time when you did more than was expected”? 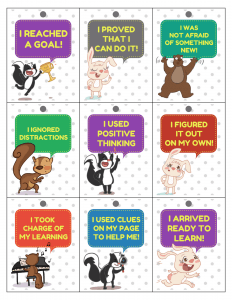 This helps your student to understand the “why” behind the Brag Tags and aids in guiding him toward thinking about his learning as something he has control over. Celebrate each time your student earns a Brag Tag by taking a photo to send to his parents and posting the success on a bulletin board in your waiting room (obtain written permission to take photos). Occasionally discuss the Brag Tags your student has not yet collected. Then, consciously create moments during lesson time where your student has the opportunity to earn the tags while practicing good learning habits. Where To Find The Brag Tags? You can find our set of Brag Tags in the Level 1+ section of WunderKeys.com (although you can use them with any age!) Click the image above or click here and then scroll down to “Level 1”. While you’re there, be sure to join our WunderKeys Facebook Group! You’ll be the first know when our brand new Primer Level method book is released… plus you’ll have access to all sorts of freebies and support in this bustling community of close to 3,100 teachers! We’d love to see these Brag Tags in action! Be sure to tag us @WunderKeys or #WunderKeys in your photos!